WiFi OffLoad means a kind of handover (or selection/reselection) technology between Non-WiFi network and WiFi Network. It is not a new concept, but it has become hot issue recently especially after LTE network is wide spread. So when we say WiFi Offloading, it usually mean that WiFi Offload (handover) between LTE network and WiFi network. Just from the user's point of view, we can think of several user model as described below. i) UE is in connected mode with LTE network while there is no WiFi Network Available. ii) UE start seeing WiFi signal. iii) User switch the connection from LTE to WiFi Network. Note : I should say this is over-simplified description. You may have a lot of questions boggling in your mind. In what criteria, user decided to switch from LTE to WiFi ? You said 'Switch the connection to WiFi ?'. Exactly what do you mean by 'Switching' ? What is the exact mechanism ? etc. I will get back to these question later.. for now, just get the big picture. iii) Network tells UE to switch the connection from LTE to WiFi Network. Note : I should this is over simplified description as well. You would have a lot of questions for this as well. How network knows that UE is seeing WiFi Signal ? How network notify UE to switch to WiFi ? etc. Now let's think about business issues... about money. What is the motivation to go for WiFi offloading? What would be your motivation to Switch your communication channel from LTE to WiFi while you are in connection? This is just tip of WiFi Offload and I will keep updating this page as I have further chance. If you are eager to know the details before I update, I would recommend following documents. Followings are the list of topics that will be discussed in this page. I will describe these topic at very high level as an introduction. I would write separate pages depending on the subject. ANDSF, what is it ? why we need it ? Now let's get just a little bit deeper into WiFi Offload mechanism. The first thing you need to understand is overall network architecture related to WiFi Offload. You would see various network architecture depending various use model. Following is the architecture showing the combination of following figures in 23.402. Most of the components are the ones that you are already familiar with normal LTE/IMS operation. The component and interfaces that you need to pay attention for WiFi Offload would be as follows : (Don't try to memorize it.. just try to follow the path with pen whenever you are studing any specific use case). 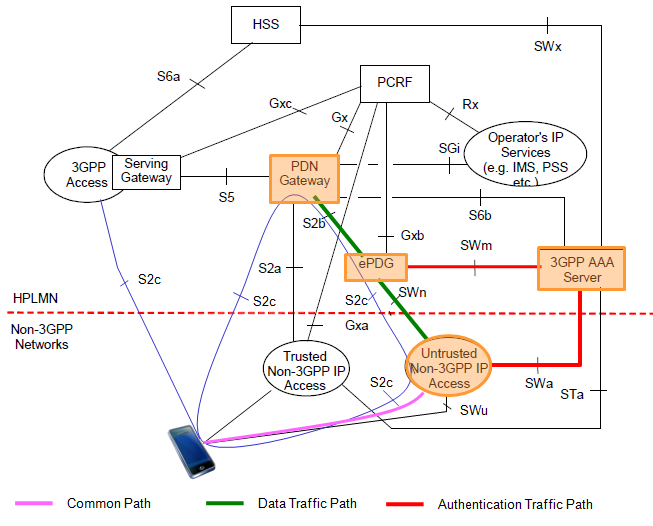 If you see the network structure for Non-3GPP Access, you would see two different path. One is through 'Trusted' path and the other one is through 'Untrusted' path. What does it mean by 'Trusted' ? Who trust who ? 'Trust' in this case is that 'Operator TRUST the access(path)'. It doesn't necessarily mean (may or may not mean) 'UE trust the path'. The biggest difference between trusted access and untrusted access would be the requirement of authentication requirement. 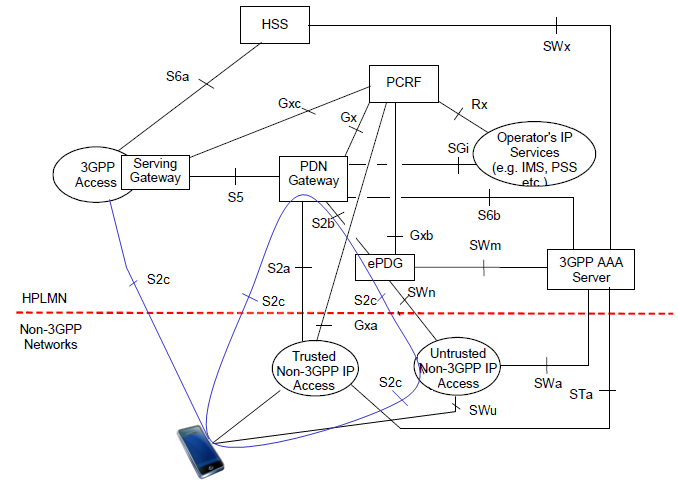 In trusted access, UE would not need any separate authentication/security process when it switches from 3GPP access to non-3GPP access (WiFi) since UE already has gone through this process when it was camping on the 3GPP access and network trust the process and assume that the non-3GPP access can be protected by the same security procedure. In this access, it is highly likely that Network Operator distribute their own WiFi Access points and let UE get access through those Access Point. On the other hand, in Untrusted access, network would require UE to go through additional authentication/security process when UE switches to non-3GPP access and use special IP tunneling mechanism (e.g, IPSec) for data transaction. In most of this case, UE would get WiFi access via public WiFi access point and those access points would be anchored to ePDG. ANDSF stands for 'Access Network Discovery and Selection Function'. This is a set of services that would answer to following questions. I am at such and such location now, which network (3GPP or Non-3GPP) are available for me ? Now my mobile phone detected 3GPP network and WiFi network, which network I have to get access to ? The specification that I referred to is ETSI TS 124 312 V11.6.0 (2013-04). Since this is relatively early stage, it is highly likely that new items or revision will be added as it goes to new version. Try following up the latest specification as it roll out. One of the 'Untrusted' access that attracts the widest attention as of this writing (Feb 2014) is through ePDG as shown below. Overall procedure and data path are as follows. iv) After completing the authentication process, start user data transaction through the green path. Most important step in this traffic flow is Authentication and Security Association step at the initial step where UE start communicating with 3GPP network over Non-3GPP Access (e.g, WiFi Access Point). This initial step is described in detail in IKE based 3GPP 33.402 section. Following is one example of WiFi Offloading From LTE network to WiFi Network. In terms of protocol implementation on UE and Test equipment side in early phase of testing (As of Jun 2014), the colored part has become the major target of validation. According to my experience on testing, step 4 and step 8 is the most tricky step to come over. Especially, passing step 4 (IKEv2) is the most difficult part to step over. 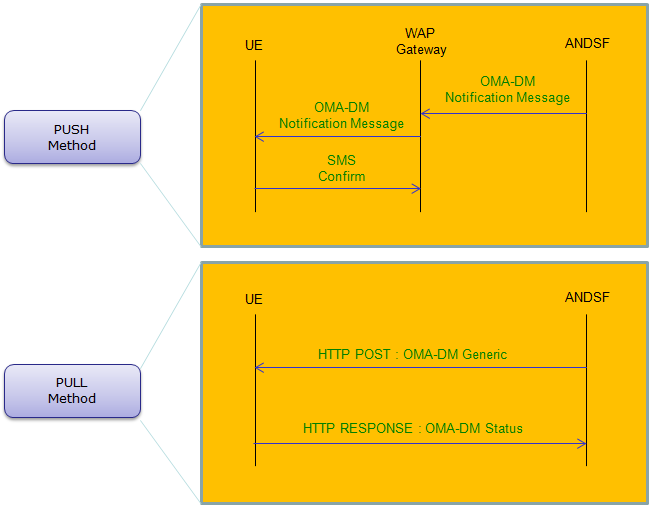 Following diagram shows overall procedure for the case where UE start communication from LTE and switch to WiFi Network (Untrusted Non-3GPP). This case assumes that UE is connected to LTE before the switch (Handover) and not connected in WiFi. If UE is already connected both to LTE and WiFi before this handover, it will skip the step 2~9 and directly jump to step 10. Step 1 : UE is initially attached to LTE network. (In the most of testing situation with test equipment, WiFi on UE turned off at this stage). Step 2 : (In the most of testing situation with test equipment, we turn on WiFi on UE at this time). UE start detecting WiFi network and initiate switching process to WiFi network. Step 4 : UE and ePDG performs IKEv2 tunnel establishment procedure. (See the details in IKE page or 3GPP 33.402). Following is the decription for this step in 23.402 and I add some comments to relate 23.402 and 33.402. The IKEv2 tunnel establishment procedure is started by the UE. The ePDG IP address to which the UE needs to form IPsec tunnel with is discovered as specified in clause 4.5.4. After the UE is authenticated, UE is also authorized for access to the APN. The procedure is as described in TS 33.234. Step 6B : PDN GW and AAA Server performs the following transaction. Step 7 : PDN GW processes the Proxy Binding Update from ePDG and update the binding cache entry for the UE. and then sends Proxy Binding Acknowledgement message. This message carries following information. Step 10 : This is for the case for connectivity to multiple PDNs. UE establishes connectivity to each PDN that is being transferred from 3GPP access. Step 11 : Disconnect LTE EPS Bearer.